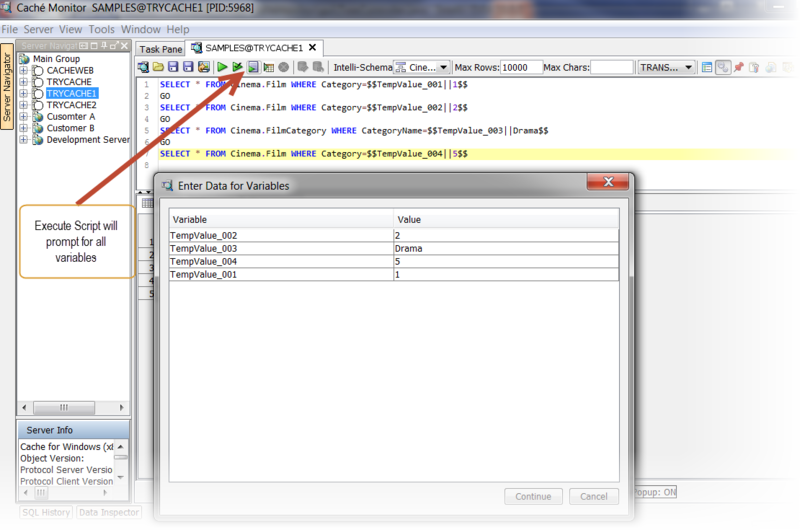 Caché Monitor can execute parameterized SQL queries. This will help writing complex scripts with variables, the variables let Caché Monitor prompt you for the values when the SQL is executed. This is handy if you perform the same statements again and again and just wanting to pass new data in. When executing the above query, Caché Monitor will prompt the user for input the variable MyVAR_001. The SQL Editor replace the value of $$MyVAR_001$$ with the value entered by the user. The entered value will be substituted for each occurrence in the SQL Script. On the message panel you find the sql statements send to the database. The variable substitution in SQL scripts supports also setting a default value. VarName = Required. The variable name appears in the substitution dialog. The entered value will be applied to all variables of that name. VarValue = Optional. The default value that appears in the substitution dialog. The variable substitution handles also complex default values like e.g. Sub selects.